I read an article the other day that the average American gains 0.8 pounds between Thanksgiving and New Year’s. My first thought was THAT’S IT?! Well hell…let’s get this eating started! Ha! No, seriously I am so looking forward to Thanksgiving. It is my favorite holiday because it revolves around family, friends and togetherness. I love that. Call me a cheeseball but that’s my favorite! It makes me realize how much I have to be thankful for in my life. My kids wrote an “I’m Thankful For” narrative and it was absolutely precious. Like adorable. Some were thankful for typical kid things like video games and toys but others were truly thankful for some deep and meaningful things. If I wrote an “I’m Thankful For” narrative I know mine would probably make me cry. I spent a better part of this year being resentful, angry and just feeling really bad for myself. If I am being honest, I still have all of those emotions inside me, but I also know that I have a lot to be thankful for this Thanksgiving 2012. My heart melts. I am so thankful for all the blessings in my life. me too! i am off for a week too 🙂 yay! so glad you are working with those precious 2nd graders who can fill you will such joy. kids are special and set us back to reality and thanfulness even my high schoolers. have a great last day and enjoy your break! Once I heard it was 7 pounds! I’m much happier with 0.8! Have a great Thanksgiving! My boys are so excited today is the last day of school for a week! I’ve been through some crazy emotional stuff the past two years and I am happy to say, this Thanksgiving, I’m letting it all go and really focusing on how incredibly lucky I am to be surrounded by the people I have in my life. I hope you have an amazing Thanksgiving Kelly! Oh my goodness, I love the sweetness of kids….when they decide to be sweet that is!! Enjoy your break from the kiddos. I will be enjoying the non-break from mine. While they drive me crazy, I am super thankful for those energetic little rug rats. I’m hoping to keep my gain to 5 pounds or less, but I think I probably gain 5 pounds every year, definitely more than 0.8! So glad you are getting a week off and have such great kids. Aaaaand, that’s the difference between teaching little kids and teaching college, haha. 🙂 I guess it would be creepy if one of my students gave me a note like that, anyway. But that is seriously the sweetest thing ever– I know those kids just love you! Such awesome students you have!! 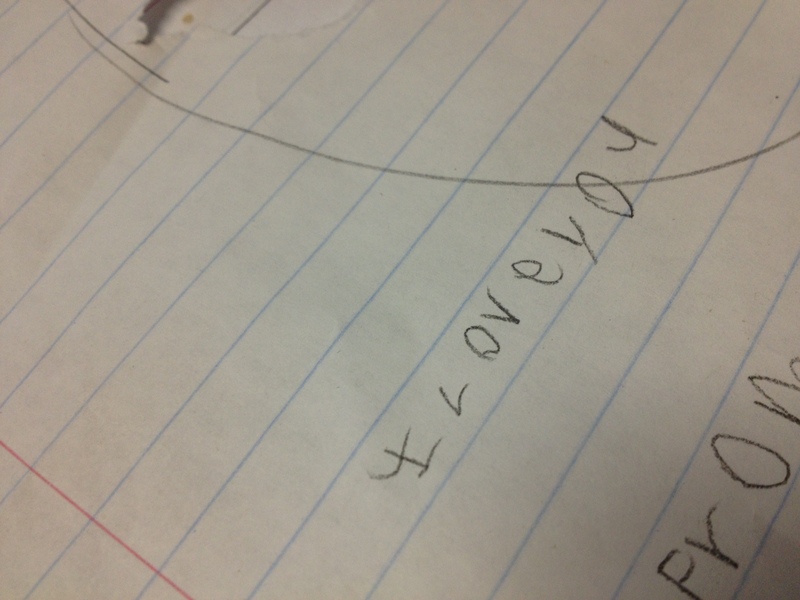 I remember when I taught…I got the cutest things from my students and it just melted my heart! I didn’t know you used to teach! What grade? How did I not know this?